The energies of the planets have an effect on everything that lives on earth. They also stay in a very special response to our Chakras and organs. For thousands of years alchemy and Ayurveda have taught it in the same way. Only recently the energies of the planets could be measured with the help of modern equipment – proving the old healing knowledge which has been known for thousands of years. It seems to be magic: seedlings growing in an entirely closed container lose weight when the new moon is coming up and put on more than usually on full moon – without adding or removing water or anything else. At the same time the amount of chemical substances in the plants changes – which according to the opinion of todays scientists cannot be possible in any way. A chemical element of the plant could be embedded into a different chemical compound but the total amount has to stay the same. Anything else would be a change of atoms, the so-called “transmutation” such as the famous alchemical change from lead into gold – and that would just not be possible. But it might be that famous alchemists such as Paracelsus simply observed the nature much better. And that is maybe why they can get a much better use of the natural effects of the essences and remedies which they produce in the laboratory than the modern scientists. The plants don't care at all about the “diagnosed findings” of todays scientists about transmutation: Still the substance of phosphorus in a plant rises in an inexplicable way on full moon and falls on new moon, however the amount of potassium rises on new moon and becomes smaller on full moon. Many scientists, like for instance the chemist Dr. Rudolf Hauschka who is known for his cosmetics have proven it in longstanding series of experiments. But how can the moon cause something “scientifically impossible” every 14 days? Other planets as well influence plants e.g. measurable: First of all Mars increases the plant growth. When Jupiter and the Sun are together in the sky or when they are in exact opposite directions the growth will be stimulated. On the other hand it will be obstructed through the same kind of meeting between Saturn and the Sun. Scientists of the naturopathic pharmaceutical company “Weleda” found out about it in many series of experiments. They discovered: If you set a plant into a cache-pot made out of iron (without direct contact of the metal pot with the soil or the nutrient solution), the influence of Mars will become stronger, in a pot made of copper the influence of Venus is dominant, in a tin pot the influence of Jupiter – exactly those planetary energies become stronger whose metal they have been connected with since ancient times. Like a kind of aerial the metal pots intensify the influence of each planet. With the plant growth, the old hermetic teachings of the connection between the 7 metals and the 7 classical planets could be confirmed in a sensational way (Chart “The main signatures of the planets”). The modern research of this old knowledge about the influence of planets started already at the beginning of the 20th century. Lili Kolisko proved with the help of the so-called crystallization pictures (certain solvents are crystallized and typical patterns will be formed) among other things the effect of the Sun on gold solutions, of the Moon on liquids containing silver and of Jupiter on tin solutions. The well known German pioneer in water flow research, Theodor Schwenk, repeated the experiments decades later and also searched for the event when two planet energies overlay – meaning when two planets are directly next to each other in the sky. He observed, among other things, a four day long conjunction (the meeting of the planets in the sky) of Mars and Saturn. In the “capillary dynamolysis” (Steigbild) investigations used, clear changes showed up: the usually very wide patterns in solutions containing lead – lead belongs to Saturn – disappeared more and more. As soon as the planets drifted apart, the number and size of the structures increased. In the same way that metals used in plant pots or in solutions build an aerial for the planetary influences, they capture their effecitve powers in our organism as well. In some body regions certain metals are concentrated in an amazing way. Tin in the oral region, enzymes and liver e.g., or gold in the brain and heart. That is where the planetary effects are more intensive than anywhere else in the organism. Crystallization pictures give proof of what is “on the same wavelength” with a planet. Solutions from the blood of a heart disease patient or a treated solution of an animal cardio muscle show the exact same crystal patterns as gold solutions and plant solutions of the foxglove (Digitalis) – and all are effected by the rotation of the Sun. That is why gold solutions and foxglove are valuable remedies for cardiovascular diseases. Once more the old knowledge of the alchemy doctors about the “relationship” in nature is confirmed: “as it is above, so it appears below” or like Paracelsus emphasized: “there is nothing on earth, that is not in heaven”. Paracelsus continually reminded us to pay attention to the signatures of the plants, metals and gems. The brilliant, warm gold has the character of the Sun, the defensive nettle is bursting with Mars energy and the pearl, highly esteemed as a healing essence by Paracelsus, is ruled by the Moon and water principle. In this way certain metals, plants and gems are connected with the 7 planets and in the human being the 7 main organs and the chakras: “So understand that the brain is the Moon, the lung is Mercury, the kidney is Venus, the gall bladder is Mars, the liver is Jupiter, the spleen is Saturn and the heart is the Sun,” writes Paracelsus. Are these “elective affinities” more than a construction of our thoughts? At least parts of the mystic planet energies can be scientifically proven nowadays. Next to the electromagnetic waves, that oscillate between the ionosphere and the earth surface (the so-called Schumann-waves), other frequencies coming straight from the planet can be measured on earth. Mainly they are electromagnetic vibrations between 0,00166 Hertz and 5 Hertz (Hertz = vibrations per minute). They are stronger when the relevant planet or the Sun or the Moon rises or sets on the local horizon and when the celestial body is in the zenith. The reason being that the electromagnetic field of our earth works like an oscillating aerial and the waves of the planets that are captured at this time, hit a certain place with more intensive power. We are continually “listening” to the sound of the planets, and it is hardly possible to withdraw from their vibrations because these wavelengths are able to penetrate panes of glass, house walls and earth embankments almost unhindered. Our cranio-sacral system pulsates in this rhythm, thus the pressure system out of spinal cord liquid and brain liquid. A disturbance of this flow can lead to a variety of different sicknesses and psychological problems. Also the vibration of our stomach muscle is in this area and recently scientists discovered the importance of the stomach with its many neurons as the so-called “stomach- brain”. Our slow brain waves oscillate in this frequency as well, especially when we are in deep sleep, deep meditation or trance. Those are exactly the conditions where we can recover the best, “to become healthy through sleep” and built up one’s strength – because we can get into an optimum touch with the regulatory effects of the planet energies. We are tuned in a steady state by the planets. There is a second important oscillating area next to the sphere between 0 and 5 Hertz, through which the human organism connects with the planets. It is through microwaves. The Sun and Saturn are especially strong microwave transmitters whereas our moon is the weakest, which is again a strong transmitter in the aforementioned oscillating area. But in our body, mainly the endocrine glands get into primary touch with the microwaves. Also the electrical charge of the cell membrane is in this area. According to the German scientist Prof. Fritz-Albert Popp, who discovered biophotonics, microwaves are the carrier of the meridian energy, those energy flows that are regulated in the Chinese acupuncture as is generally known. Our organism is kept in the right balance through the waves of the planets, just like a radio-controlled clock. But what happens if the human vibration system is disturbed in its connection with the natural frequencies of the planets? When technical radiation from mobile phones and microwaves have a steady influence and even the deep sleep is not undisturbed anymore? The human energy system tries to regulate the element of interference. That might work for a while but through this permanent activity it will be more and more overloaded. This leads to sleep disorders, allergies, chronic exhaustion or hyperactivity, chronic inflammation, metabolic disorder and vague pains. And finally, in the weakest part of our body, a serious illness may break out. According to the alchemy doctors every illness is connected to a lack or imbalance of the planetary energy. “Not the gall bladder causes the anger but Mars does. He makes us seething… Every illness starts in the constellation and from the constellation it gets into the human body. Meaning whatever is started in heaven, will be finished in the human body,” emphasizes Paracelsus. And so the remedies developed by him and other alchemists “tune” once again our organism to the melody of the planets. And because the metals are the best aerials for the planetary waves, and at the same time being extremely difficult to get a healing essence out of them, they are regarded as the supreme remedies of alchemy – ahead of all the Aurum Potabile, the highly praised universal remedy, the “drinkable gold of the alchemists”. If you put the corresponding planetary-metals into order after their conductivity for heat and electricity, the same sequence of the planets will be the result – and the same order in the arrangement of the planets will be according to their mean orbital speed. In this “dark” planet-Chakra-response the solidifying forces dominate, which lead to typical illnesses: formation of all kinds of stones, arteriosclerosis, stiffening of the joints and the spine and he becomes “petrified” and “sclerotic” in body, spirit and soul. 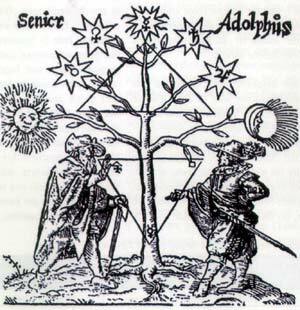 The “philosophers” tree (the experts in the secret symbols of alchemy) with the seven planets. In the lower triangle the three basic principles Sal, Sulphur and Mercury or as the transformation stages Nigredo, Albedo and Rubedo between the old man and the young man. The particular interplay of the planet energies and the basic principles lets us age or keeps us young. But how can you find out at an early stage, which processes dominate in oneself – if you rather vibrate in the dark Nigredo or in the bright Rubedo? How can anyone, already at the beginning prevent a disharmony or even a “fall” into Nigredo? The alchemical doctors use a kind of constitutional diagnosis. They analyse which of the three alchemical basic principles “sal“, “sulphur“ or “mercury“ prevail in the individual and accordingly, which planetary forces. Only in the Chakra-response of Rubedo, under the dominance of the balancing Mercury processes, are we in harmony and only then the life energies of the planets, of the Sun and of the Moon can flow through us unhindered and with full strength. And then we can finally transform the “dark lead” within ourselves into the “brilliant gold” just like the seedlings mentioned in the beginning. Crystallization pictures show similar patterns when dealing with similar effective powers. Here the solvents of gold (above), foxglove (middle), and cardiac cells (below). Gold and foxglove are being used as a remedy for heart diseases and all three show a sun-signature. “capillary dynamolysis” (Steigbild) investigations with a solvent from the “Saturn-metal” lead during a conjunction of Mars and Saturn. Clearly recognizable, that the Saturn energies of the lead, who are forcing to strengthen and shape, are being reduced through the influence of Mars. Picture above: before the meeting of the planets extensive patterns can be seen, middle picture: five days later during the conjunction nearly all of them are dissolved, picture below: after the conjunction another five days later all patterns are well-shaped again.